Mother’s Pizza has been open for just over a week now but I have been itching to go there for ages. Located on the corner of Agricola and Young, I impatiently watched this building develop from the ground up, wondering what the structure would be. Finally, once the lovely black and white tile went up, I just knew it was going to be a restaurant. After doing a little research, I found out that the restaurant was going to be Mother’s Pizza, the second location of the pizza joint, the first of which is located in Turks and Caicos! 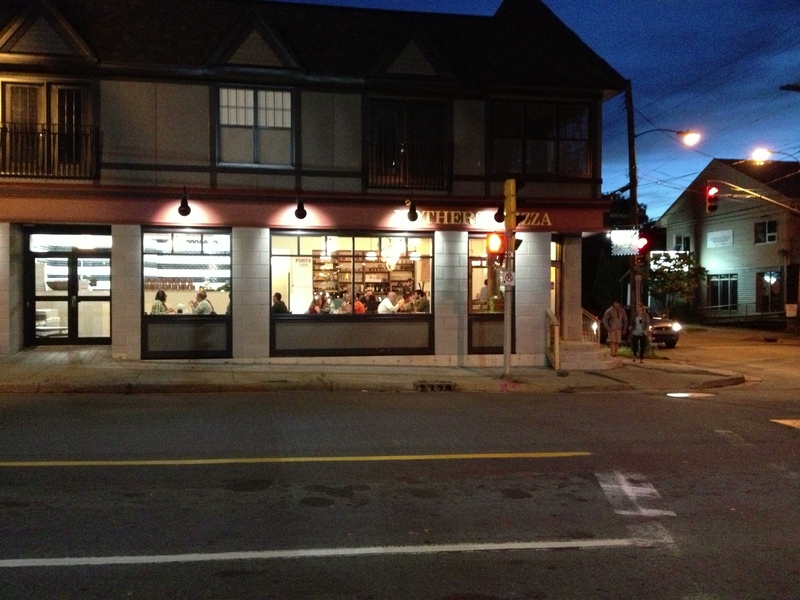 Owner Tyson Wachter opened the doors to Mother’s in Halifax last Friday evening to an eager crowd of hungry Haligonians. With great anticipation, Adam and I finally got the opportunity to try Mother’s Pizza last night. Even though it was 8pm on Sunday evening, the 40 seat restaurant was full, and we had to wait about 20 minutes or so for a table. I didn’t mind much because I got to soak in the decor and notice some of the awesome nic nacs I probably wouldn’t have seen had I been concentrating what to order. From the friendly green gnomes and mason jar planters on the tables to the locally made wooden furniture, the aesthetic of Mother’s is fresh and cool. A lot of the antique looking lighting and building materials are refurbished: the big chandelier in the centre of the room is made of giant pizza whisks! Once we were seated by our very friendly server, we ordered drinks. I was disappointed to learn that Mothers Brew, the ale brewed for the restaurant by Garrison, was all gone, so I ordered a pint of Bridge Brewery Summer Ale. 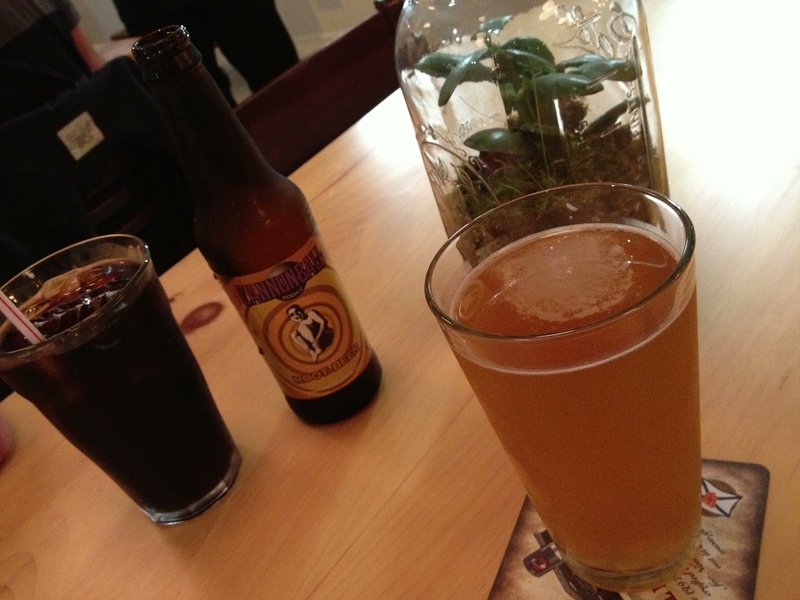 It was my first time trying Bridge Brewery beer and I don’t know why I waited so long; it was yummy. Super wheaty and fresh, I’m sad I only tried the summer brew in September! Adam ordered a Garrison Cannonball Root Beer, and we waited for our food to arrive. It didn’t take too long for our salad to appear. 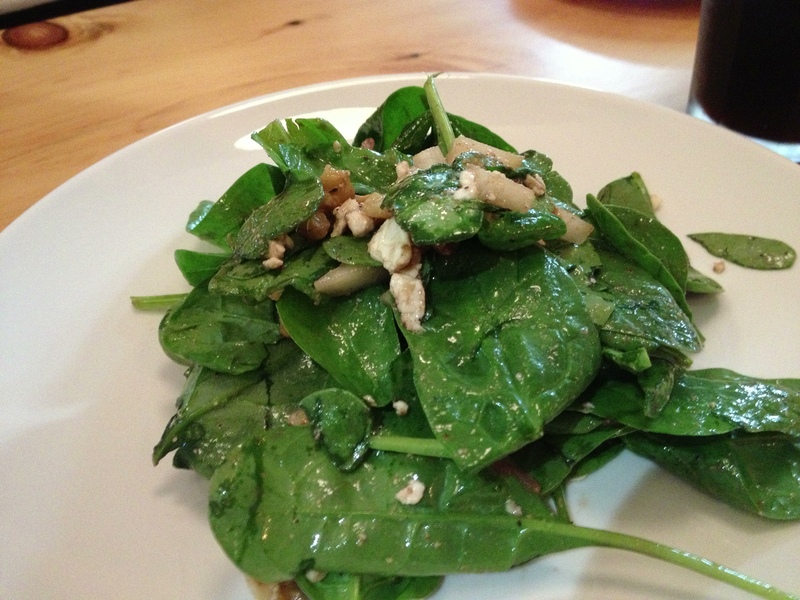 We ordered a Spinach Salad to share as an appetizer and the flavours were delicious. The baby spinach was covered in a maple dijon vinaigrette and tossed with blueberry, pear, crushed walnuts and feta cheese. My favourite component was the pickled onions; the pinky hued veggie added a great punch to the salad. I was impressed, it’s hard to make me this excited about a salad. We finished the salad in like 5 seconds, and then waited what seemed like an eternity for our pizza to arrive. We were just starting to get impatient when the manager came over and informed us that it was going to take a little longer for our pizzas; the crust had come out a little too brown for her liking so they were being remade. I have to say, I really appreciated this for two reasons: 1) I really like when servers come over and calmly tell you why your order is taking so long, it shows respect for the customer; and 2) I am always impressed when restaurants take such pride in their food that they won’t send out a meal that doesn’t look right. I commend Mother’s Pizza for really trying to get it right. The pizzas finally arrived. Adam chose the White pizza which was served with local chorizo sausage from Peasant’s Pantry. 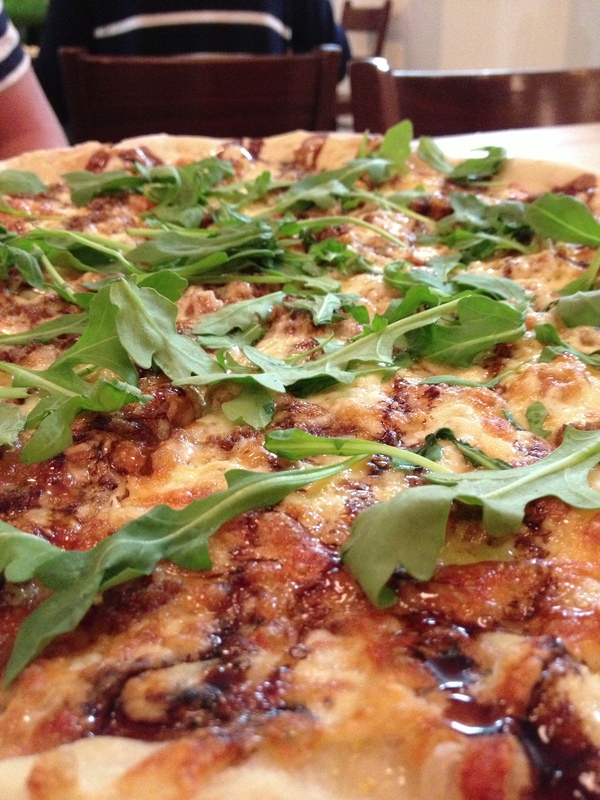 The pizza of walnut, mozzarella, and smoked gouda was drizzled with honey and balsamic reduction and then topped with fresh arugula. I liked how the cheese got really baked into the crust because of the lack of sauce, essentially making the pizza glorified garlic fingers. Let me back up this statement by saying that this is not a slight and confessing something: I actually prefer garlic fingers to pizza. Crazy I know, but that’s just the way I am, so calling anything by the name ‘garlic finger’ is a huge compliment from me. The White pizza was amazing. I was happy Adam ordered the 16 inch size pizza so we could have some for lunch today, and for 16$ it was quite the bargain! 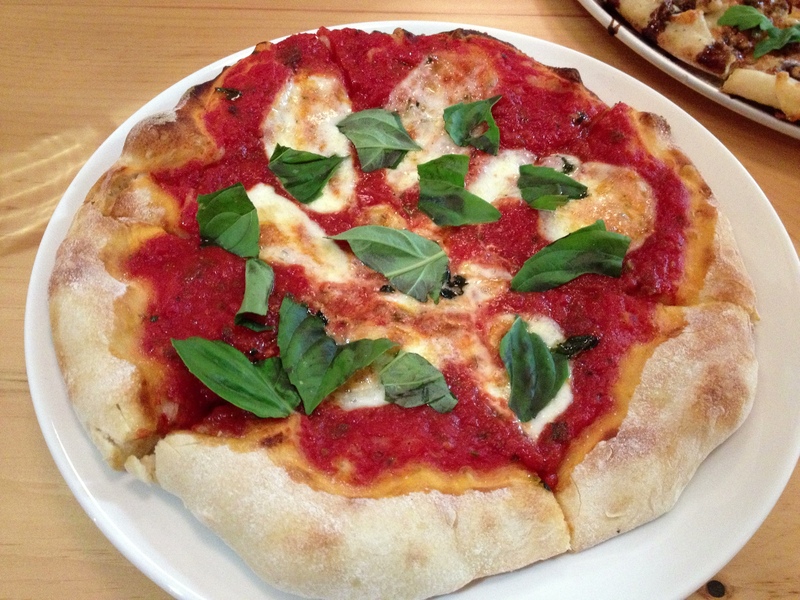 I chose to go simpler and got the Margherita pizza, which was…whelming. The pizza didn’t impress me, nor did it disappoint me…it was just okay. The fresh basil atop the pizza was awesome, and I really liked the crust, it was the perfect balance of chewy and crispy. But I was slightly depressed about the lack of mozzarella, and though I am aware that Margherita pizzas do not traditionally contain a significant amount of cheese, Mother’s could have put a touch more on their Marg. For dessert there are several delicious sounding options at Mother’s including Grapefruit Brulee and Mother’s Bumbleberry Pie. 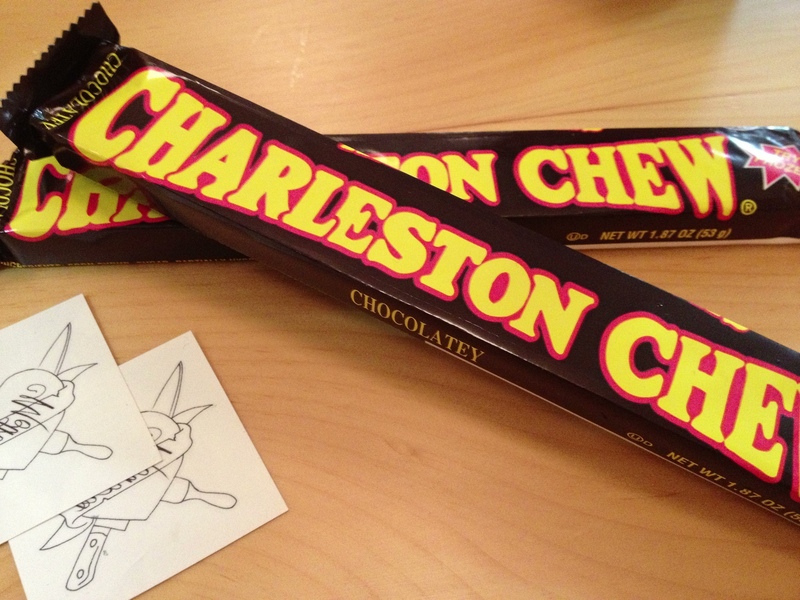 But there are also some endearing additions to the menu including Abba Zabbas and Charleston Chews. Being super full from all the pizza, we went for the nostalgia and ordered the chews. Of course, they were delightful! Overall Mother’s Pizza was a hit. Though their Margherita lacked cheese, they make up for it in spades with the service. We were greeted immediately at the door, and their attention to detail and pride in the food they serve give this restaurant great bones to succeed. The food was great, well priced, and it is a great place for date night or a casual meal with friends. I hope to you all will Explore.Eat.Repeat. your way up to the North End and try Mother’s Pizza sometime very soon! Cost: 52$ for a salad, a 16inch pizza, a 9inch pizza, two drinks and two chews…a great deal! Things I liked: The amazing friendly service and the chewy, cripsy pizza crust. Things I didn’t: Running out of food items, but they’re new, this will go away. Best Place to Sit: With a big group of friends at the gorgeous wooden table in the centre of the restaurant. What To Order Next Time: The four cheese pizza…I need more cheese! Hey Food Diabelo, thanks for reading! There are some variations on Magherita pizza, some have bocconcini, others have fresh mozza, which is supposed to be thickly sliced, but it wasn’t think at all at Mothers, that was my problem.